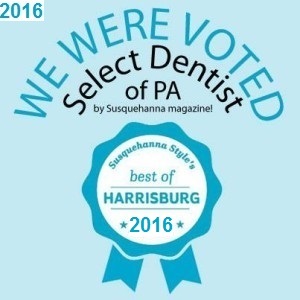 We Were Voted Select Dentist Again! Mechanicsburg,PA – Our colleagues agree with our patient’s, that we are dedicated to providing great dental and customer service! Select dentists are voted on by local dentists with the following criteria in mind: Nominees are members of the American Dental Association and the Pennsylvania Dental Association and dentists were asked to evaluate the practitioners with whose work they were familiar. The dentists polled were asked to consider patient experience and their results, as well as, continuing education, years in practice, and the use of new technologies and techniques by the dentist. Susquehanna Style partnered with independent market research firm, Polk Lepson Research Group of York, PA to conduct and tabulate the results of SelectDentists™. We are committed to maintaining a state of the art office and providing great care and service.